STORY: Set in the 19th century, strong believers of legends, myths and superstition search for fame, fortune and glory. One legend above all is sought after by many, a treasure which can make any dream come true. 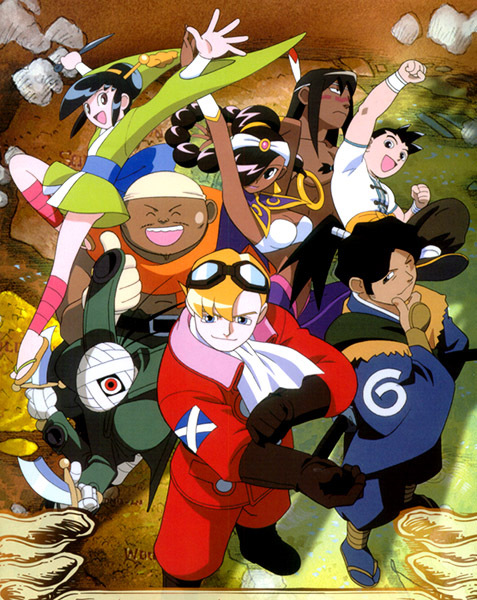 Believers from all over the world set out to search for this treasure, and are forced to fight against one another in pursuit of the legendary Power Stone. The characters are a mixed bag, but some are catchy. 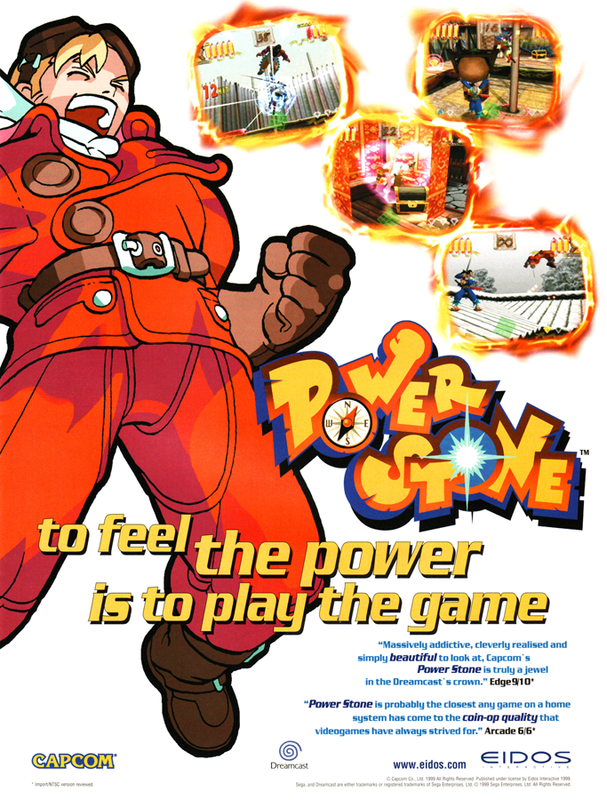 REVIEW: Originally released on the Sega NAOMI arcade board and later ported to the Dreamcast & Sony PSP, Power Stone is an innovative 3D fighting game featuring 10 original characters. 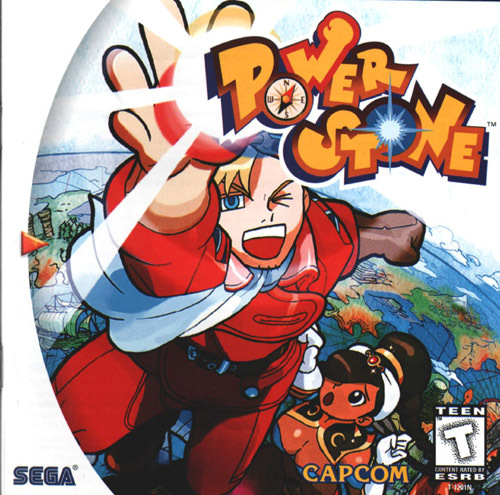 Power Stone clearly isn't the typical fighting game, which is surpising considering it comes from Capcom's neck of the woods. 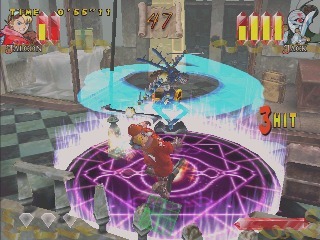 In Power Stone, players can freely run around fully interactive environments as they battle it out. 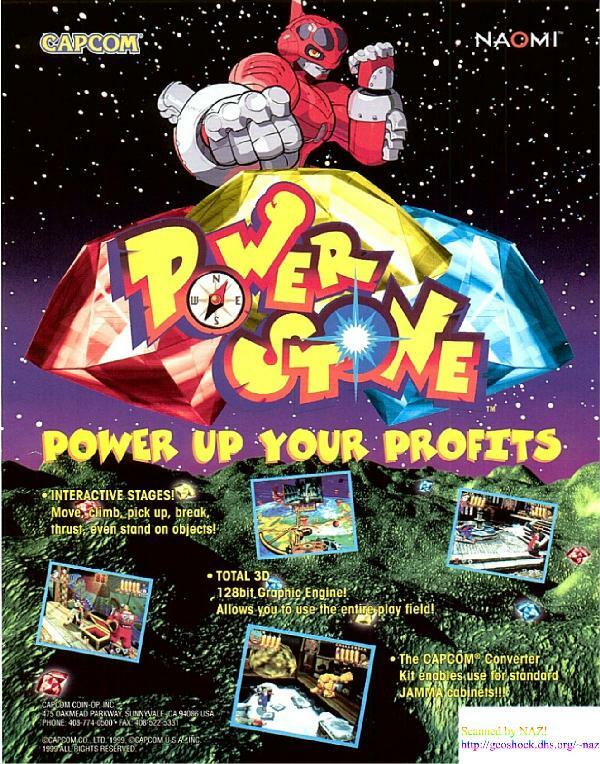 Power Stone prides itself on being the first "go-anywhere grab-anything" fighting game, and offers a gameplay experience unlike any other on the market. 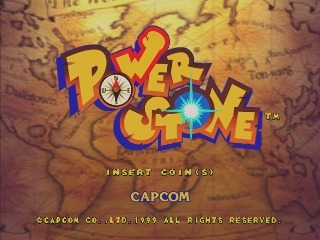 You might say Power Stone's art style and theme is on the "kiddy" side, but the gameplay is clearly where it's at. 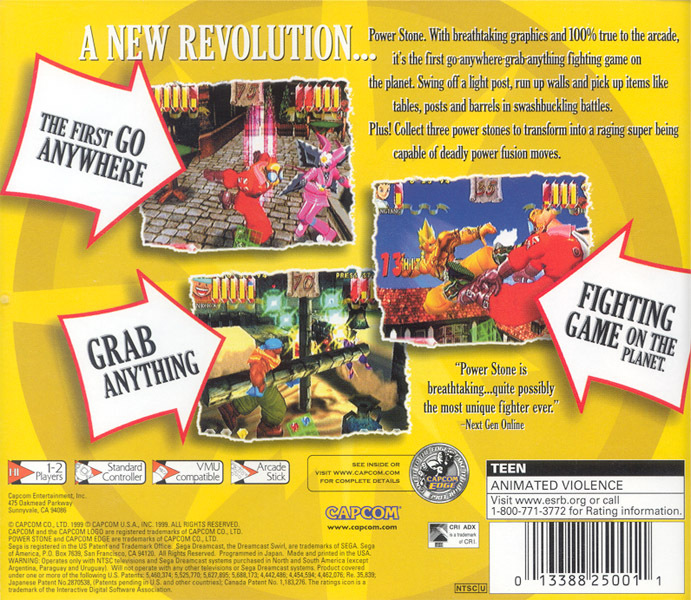 At the time of its release, it was certainly an innovative and "refreshing" fighting game. Giant hammer of death... FTW? 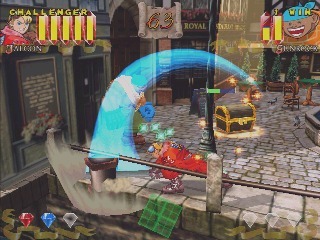 The three dimensional gameplay of Power Stone allows fighters to pick up and fight with random objects as chairs, tables, bombs, bazookas, flame throwers, swords, Molotov cocktails and countless more, all can be used against your enemy. 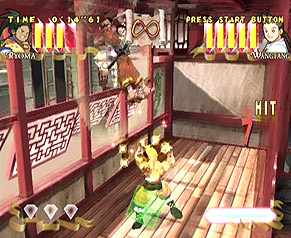 During the battle, "Power Stones" will appear in random places within the arena. 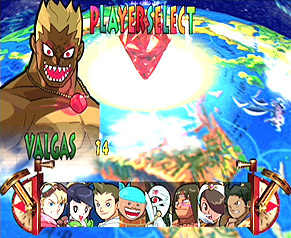 When a character collects three Power Stones, he or she will transform into a raging "super being," which allows them to execute insane power "Fusion Moves." 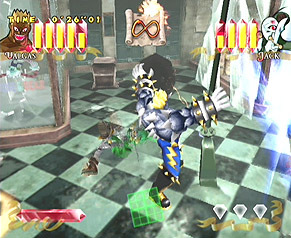 Each character has two of these... one is usually a long-range attack and the other a grab or close-range move. 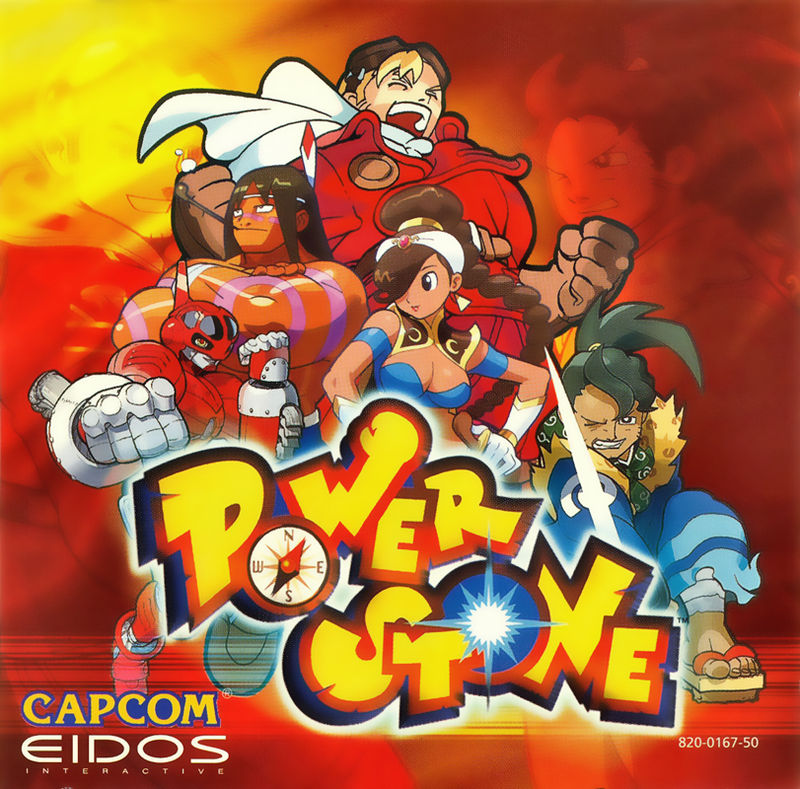 Final Words: If you're looking for "uniqueness" and "off-the-wall action" out of a fighting game, Power Stone may be your ticket. Although the characters might be a bit goofy and childish, the gameplay can be pretty addicting and definitely worth a try.